While we count down the last few Doom Patrol-less hours of 2016, I thought it might be helpful to pool all of the Gerard Way interviews. Y'know, in case you need something to read or watch while you're waiting to put your paws on the first Young Animal comic. Here's a bit from Blastr. CBR's interview can be found here. Rolling Stone had a sitdown with Way. PI Culture Blogs has an interview with him on YouTube. So does DC Comics. In this one, Way says, ". . . it's in a really strange place for Cliff to be. . ." Having read it, I can say, yeah. Yeah it is. 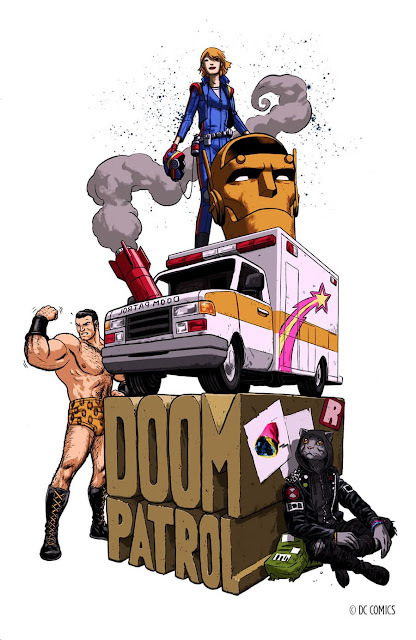 Even for the Doom Patrol. AV Club was among the first to provide us with the solicits. ComicBook.com sat down with Way and his Cave Carson Has a Cybernetic Eye co-writer, Jon Rivera. Comicsbeat has this one for you. Of course you can find something about Way and the Young Animal imprint on EW. . . .and let's close this one out with a bit from io9. All of these bits are naturally copyrighted wherever the link takes you. All links shared under fair use. Cool links, thank you! I haven't been following DC's latest, maybe I should pay attention.